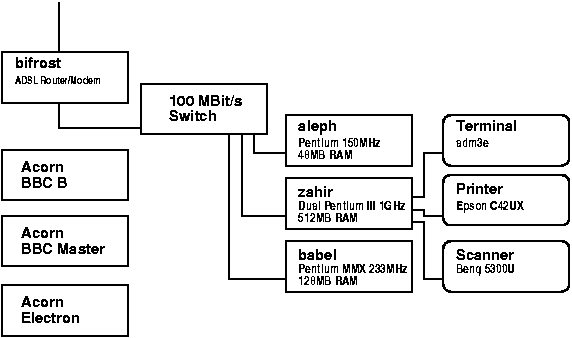 aleph is a single-cpu P150 machine with 48MB RAM and two 3GB disks. babel is a single-cpu Athlon XP2600 machine with 256MB RAM, and 180GB of disk space. This is currently being a fileserver, webserver, and mailserver. zahir is a dual-cpu machine with 512MB RAM, two 1GHz Pentium III processors, 40GB disk, SCSI CDROM and CD-Rewriter, 250MB Zip drive, and DVD-Rewriter. This one is my main desktop and development machine. bifrost is a Conexant AMX-CA61E ADSL ethernet router/modem. I have plans to build a small Beowulf cluster but the attic needs flooring first. The naming convention is currently (mostly) Borgesian, but the postulated Beowulf cluster will probably end up with the more Zelaznian name of ghostwheel. Both of the above machines run Debian (GNU/) Linux as will, most likely, any future additions.